Have a look at the first entry in the guest book( at the bottom, not mine)...then another one a few lines up...Can you imagine.4 years to find out. Vive la transparence. I of course kept an eye on him, but he seemed so comfy! 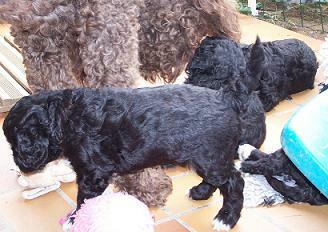 I am preparing a list of breeders (future breeders) who are working for the survival of the "Old Barbet bloodlines". If you would like to be a part of that list and I do not already have your name, I would be happy to add it, along with a link to your website. Many people are having a tough time wading through lists of people, many of which have stopped breeding. thank you. Pr. Triquet is the one who set up the system of using a standard standard. This is a standard "standard". Number 10 describes the coat; the length, the texture, how it grows, the thickness, the undercoat if any, and also how the dog should be groom IF grooming there is. 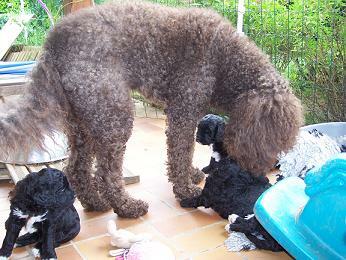 The standard for the Barbet says "long coat". The definition of a long coat is 10 to 15 cms. Not less and by no stretch of the imagination 4 to 8cms or 5. NO club can arbitrarily decide to interpret a standard differently, whatever the country may be.The coat is characteristic of the breed!!!!!! Then, if judges, some judges don't read the standard either( which we know is the case), then there is a problem. The French club is there to make sure the standard is read and correctly interpreted.That is their job. Now, if they can't even do that properly and people complain to the SCC, meaning the club's hierarchy...only then can and will the SCC step in to ask questions abot management questions. Otherwise that is not their job. 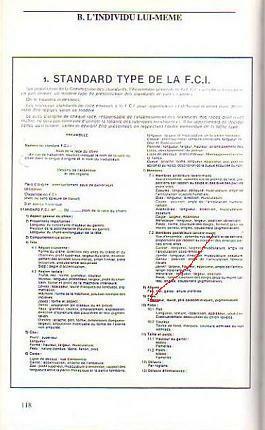 That is probably the reason why I was told last September in Mâcon, by probably one of the most competent judges alive, that Compay's coat was too short.Of course, I was not given details because that's NOT his job either. It seems that many were on my site yesterday looking for fuel. Now you have some more. This is not my invention...but should be posted in places where people can read it...properly. Let's not ridicule our breed at the World Dog Show next year in Paris and be everyone's laughing stock with commenst like, "are those the same breed?" hahaha . 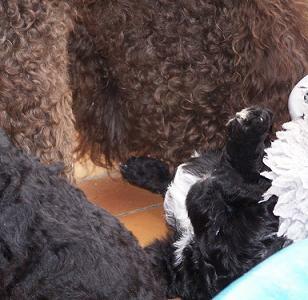 Uncle Booly Wooly cleaning ears, faces...and private parts.This happens with every litter since has was young. As I mentionned earlier: raising pups is a family affair! ...and these live at my friends' in the south of France( Papillons du Ventoux). My friend used to breed Papillons, but after a very bad accident she had to stop. So, she kept the older ones and placed the young ones that could still have litters, with a friend of hers. 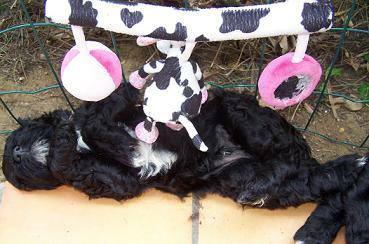 We have that in common, we keep all our dogs, because they are part of "la famille"...even if they are fixed. I couldn't even imagine Thelma leaving me. 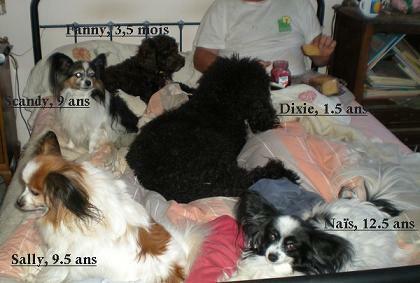 You will see Fanny in the photo, but not Frankly Scarlet, because she is not allowed up on the bed seeing that Brigitte doesn't want to give her any bad habits before she goes to Canada! * so, perhaps when people say I'm crazy...maybe I am. As long as it doesn't show too much...then,and I can live with my collection of Barbets, who cares, right? !